Maximum Rate of Fire 30 r.p.m. PM-41: 559mm Barrel, Traverse 9° at 45°& 16° at 75°, Weight 10.5 kg, No tripod, relied on its barrel yoke which contained traverse and elevation adjustments. Notes The Soviets developed a series of light mortars and these were known as company mortars (Rotniy Minomet). These light portable mortars were based on the Stokes design and provided support fire to infantry platoons. The RM-38 was the first to be issued and this was developed in 1937 and this was followed by further models each with minor improvements. The PM-38, 39 and 40 were mainly built along the same design, but the final model (PM-41) was different in that it didn’t use a bi-pod, but used a yoke to adjust the range. 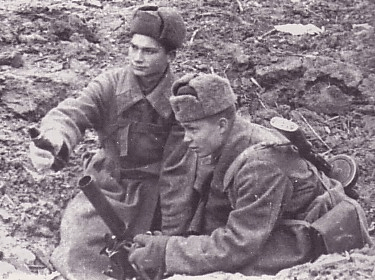 They were issued at one per infantry platoon, but due to losses suffered by the Russians in the early phase of the war, they were moved to mortar battalions along the heavier 82mm. They were then moved back to the infantry companies and placed in a mortar platoon.